Something's been picking off the cattle on Izzy's family farm. They've lost one cow every full-moon for some time now. But when Izzy tries to confront her parents about a beast in the woods, they just shoo her off, suggesting it's only her imagination. Then one night she overhears them talking, and their hushed whispers confirm her suspicions. There's a really big something lurking in the oaks just beyond their house and someone needs to take action before they lose their farm. That very night Izzy sees a monster, up close and personal, peering into her bedroom window. So, she sneaks out to get a better look at the elusive beast. 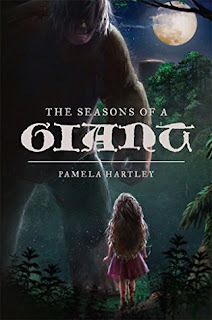 Pamela Hartley's The Seasons of a Giant is a delightfully imaginative tale that will entertain and inspire young audiences. Izzy is a kind-hearted and brave protaganist who makes a great role model for youngsters. When she befriends the giant her loyalty will be challenged. A unique plot twist keeps readers guessing right up to the suspenseful finish. Recommended for home and school libraries, The Seasons of a Giant earns the Literary Classics Seal of Approval.